There are many monuments and memorials in Germany! Had any other country been home to Graf Ferdinand von Zeppelin, perhaps that country would have reason to memorialize such a magnificent and notable man! The great airships of Count Zeppelin were an amazing engineering success, becoming known as "Zeppelins", and the word entered the lexicon to represent all airships! Yes, the Zeppelin was used in war, and some shun its recognition as a technological achievement, but so was the "Jeep" a tool of war yet no one is arguing that the "Jeep" should be so shunned as they shun the Zeppelin! This site is not about the politics of war so let's move on. Jump to a particular Monument using the "German Monuments" links above, or simply scroll this page. There are so many monuments in Germany I divided this page into two parts. This page is Part 1. You find Part 2 linked above. You may also return directly to the "Then & Now" main page or return (back) to the previous, "Monuments & Museums" page. Freidrichshafen was the de-facto home of the Zeppelin factory from the late 1800's to the mid 1900's. There, Zeppelin built his first airship (on the banks of Lake Constance at Manzell) and created his company which soon dominated the airship world. It should be no wonder that Freidrichshafen honors this great man with quite a number of monuments. 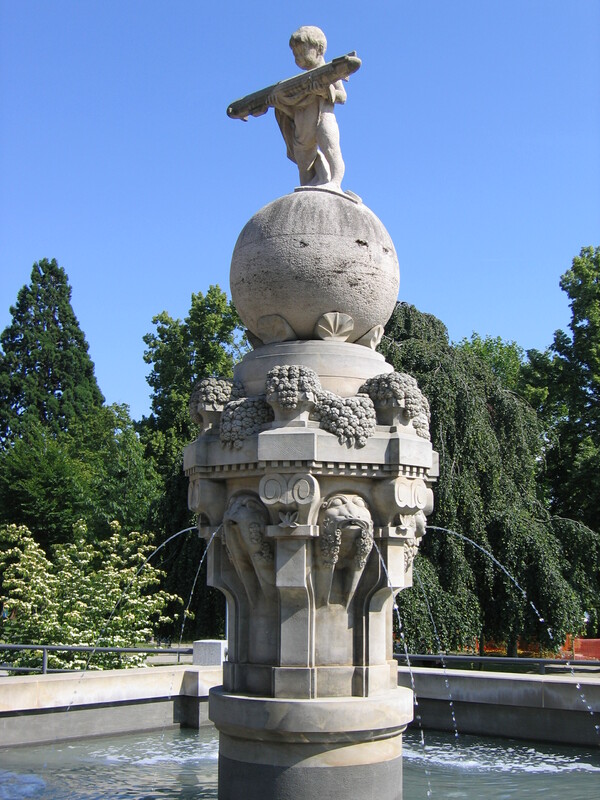 In no particular order, this 1st monument is a fountain honoring Graf Ferdinand von Zeppelin. The statue in the fountain is the original statue from 1909, having survived both World Wars. 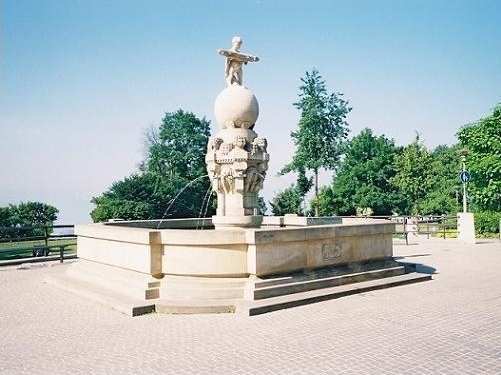 In 2000, the fountain was rebuilt as a reconstruction of the original. Also in Freidrichshafen is a striking black triangular monolith, not far from the fountain (above), another honor to Graf Ferdinand von Zeppelin. "It is enough to wish for something and to believe in it; then it will be a success. Count Ferdinand Von Zeppelin 1838-1917"
And on the third third side: "In honor of Count Ferdinand Von Zeppelin built in gratitude by the city of Freidrichshafen". The monument was erected by sculptor Toni Schneider-Manzell (1911-1996) and inaugurated in 1985. Mr. Schneider-Manzell, hales from Friedrichshafen-Manzell. Great thanks to author Ian Castle who provided photos of the monolith with the text of the inscriptions. 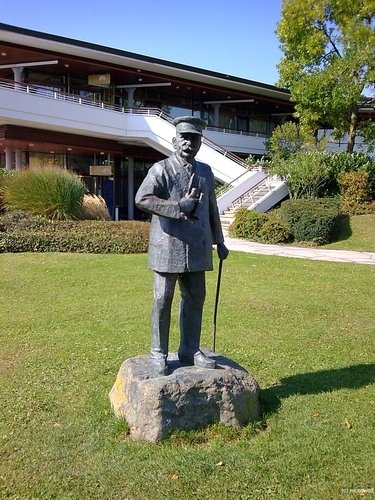 There is also a tribute to Graf Ferdinand von Zeppelin at the "Graf-Zeppelin-Haus" in Friedrichshafen. This site is a conference center situated on Northern side of Lake Constance, nevertheless the national pride in Graf Zeppelin is on display here. There is an identical statue of Graf Zeppelin at the AERONAUTICUM in Wurster Nordseeküste, Germany, (Lat Lon) 53.775013 008.638329. And at the Städtischer Friedhof - Hauptfriedhof Friedrichshafen (Municipal Cemetery - Main Cemetery Friedrichshafen) there is a large memorial to the Germans who died in the Hindenburg, May 6th, 1937. The monument reads (crudely) in English: "The dead of the LZ-129. They gave their lives in faithful duty / service of the community, on May 6, 1937 at Lakehurst USA and yet they still live in German aviation." 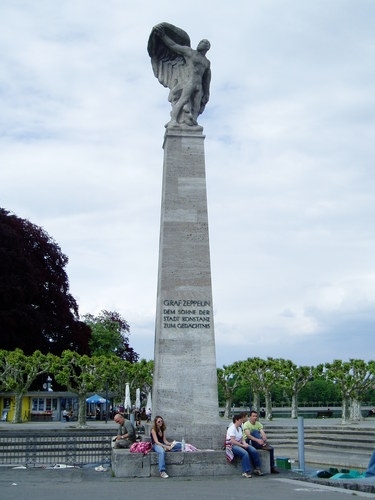 In Konstanz, Germany, there is a fine monument dedicated to Graf Ferdinand von Zeppelin in the public square facing Lake Constance. Talk about bad luck! Bad luck for Graf Zeppelin and his fledgling company while somewhat "good luck" for us now 100+ years later in that today we know, without a doubt where the unlucky airship met its fate. Think about it! Only the 2nd great airship built by Graf Zeppelin and we know where it was forced to land on its 2nd flight attempt! 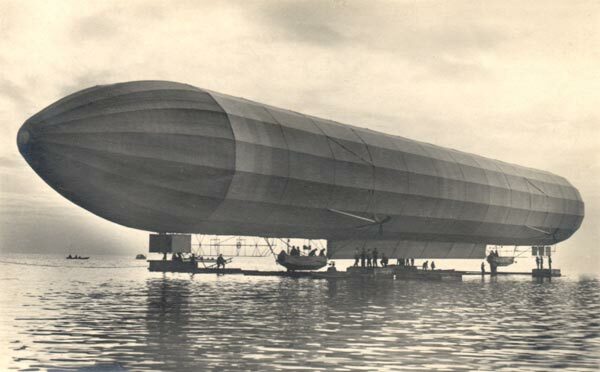 The LZ-2 was first taken from its floating hangar on the lake on 30 November 1905 but never lifted off from Lake Constance due to unknown mechanical issues. 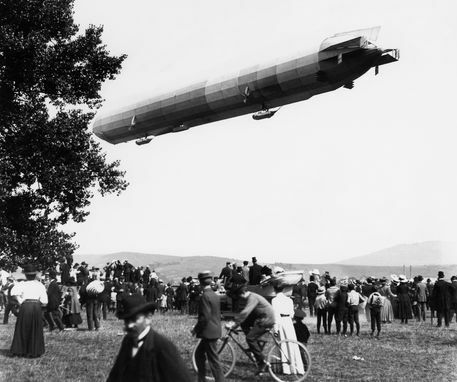 It first ascended on 17 January, 1906, but was damaged beyond repair after an emergency landing due to an engine failure. It was forced to land west of Waltershofen, Germany. Presumably, the engine problem could have been remediated but the airship was irreparably damaged that very evening in a storm. This next photo shows the LZ-2 as it is dismantled. It must have been a heartbreaking event for Graf Zeppelin. 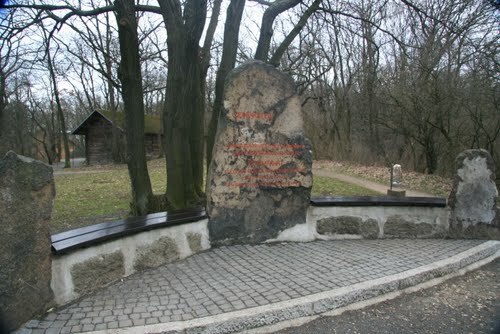 A monument was erected for the LZ-2 near the spot it was forced down. Today, this location is still marked by this magnificent marker! The magnificent LZ-3 was first launched October 9, 1906 and made a number of successful flights and underwent numerous modifications including being lengthened. Ultimately, it was purchased by the German Army, becoming the "Z-I". It was tested and used for training until it was retired and dismantled in early 1913. See Wikipedia. On April 1, 1909 the LZ-3 (Z-1) was flown from Friedrichshafen with Count Zeppelin, a crew of soldiers and several officers of the engineering corps. The purpose of the flight was to fly to Munich and back to Friedrichshafen as a demonstration of performance for the military, the new owner of the airship. At Munich, the Z-1 was to be reviewed by German Royalty and then land at the Oberwiesenfeld Parade Ground (now the same location as the present Munich Olympic Park). 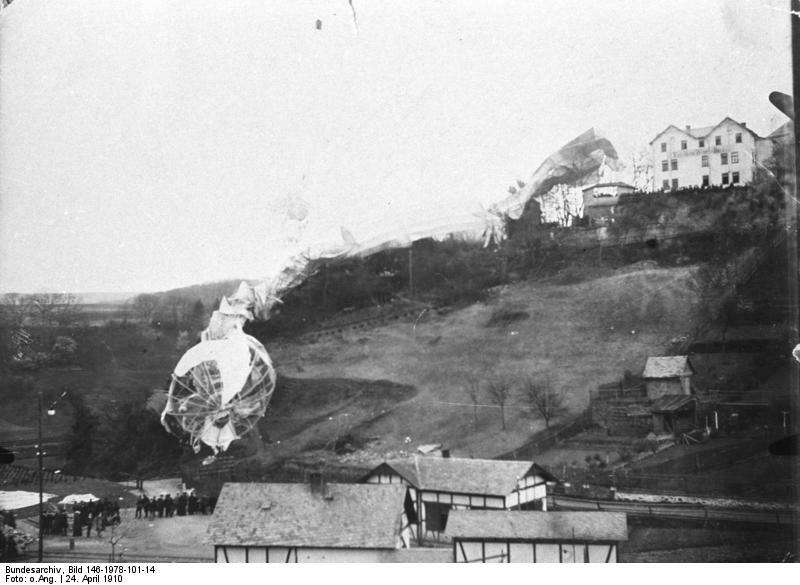 Shortly after arrival in Munich the airship was caught in a gale which prevented a landing and blew the airship to the Northeast away from Munich. Struggling to keep the ship under control in the storm, the ship eventually was able to be brought safely down in a field near Dingolfing - about 50 miles northeast of Munich. Repairs were made, and the next morning, April 2nd, the Z-1 resumed its journey to Munich where it landed at its original destination and was met with great fanfare. That same afternoon the Z-1 was flown back to Friedrichshafen. In recognition of the landing of the Z-1 near Dingolfing, and enormous monument was erected. 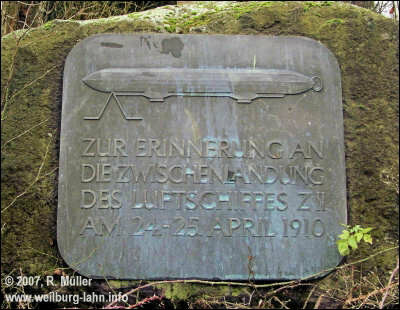 The simple inscription reads "Zeppelin I landing of the first balloon in Bavaria 1 April, 1909". The LZ-3 (Z-1), however, was quickly dismissed by the German Army. A June, 1909 notation in "Aeronautics" magazine reports: "'Zeppelin I' has been discarded for war purposes. It is declared too slow. It is to remain at Mansell on Lake Constance to serve as a 'training airship.'" The LZ-4 has been honored with three monuments. Two are at Kornsand, Germany, and one at Echterdingen, Germany where the great airship was destroyed in a storm. 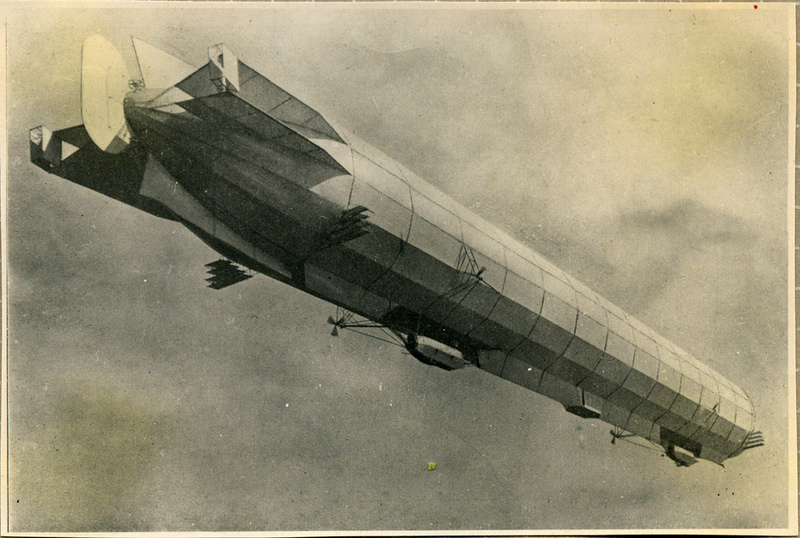 On 4 August, 1908 the LZ-4 lifted off in the morning on another of its trial fights, this time from Mainz to Zürich. 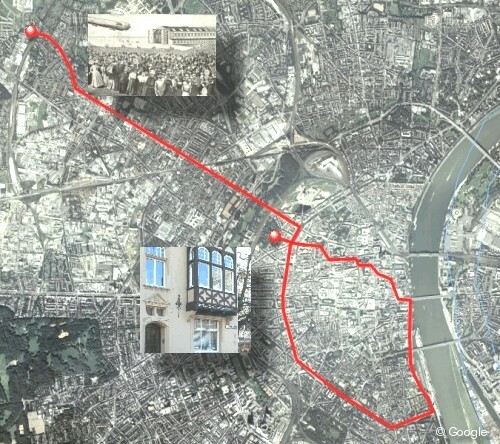 Large crowds gathered along the route to witness the flight, which took her over Konstanz, Schaffhausen, Basel and Strasbourg. Shortly after passing Strasbourg the forward engine was shut down due to low fuel. A combination of problems then caused the airship to consume too much fuel to maintain altitude and a 2nd engine had to be shut down due to the state of the dwindling fuel. Finally, two more engines were shut down and a landing was forced on the Rhein near Oppenheim, 14 miles short of Mainz. Upon landing on the Rhein, unneeded crew and supplies were abandoned to lighten the load, and about 10:30 PM, 4 August, the flight to Mainz resumed. Though refueled at Mainz, early the next morning, 5 August, further engine problems were encountered and the LZ-4 was forced down again, this time at Echterndingen. 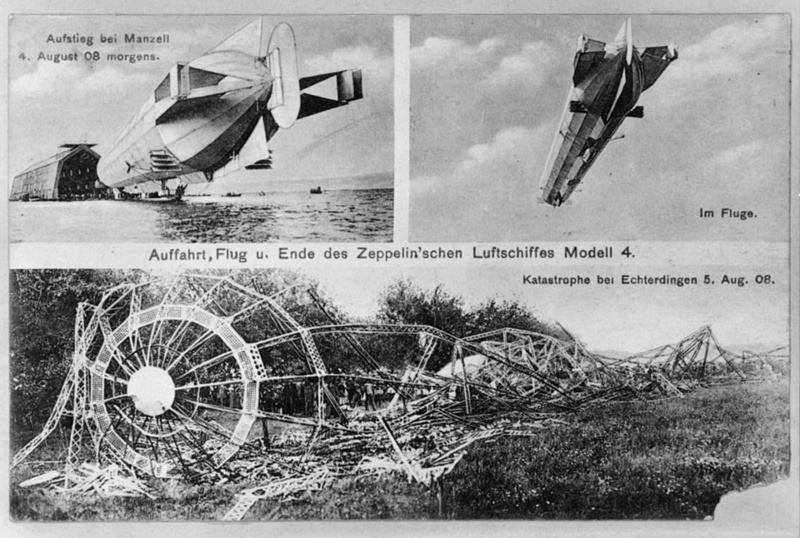 During the time of the repairs at Echterdingen the afternoon of 5 August, the LZ-4 was torn from its moorings by violent winds. A ground crew on-board brought down the airship again, but it was damaged against some trees and burst into flames and the airship was destroyed. 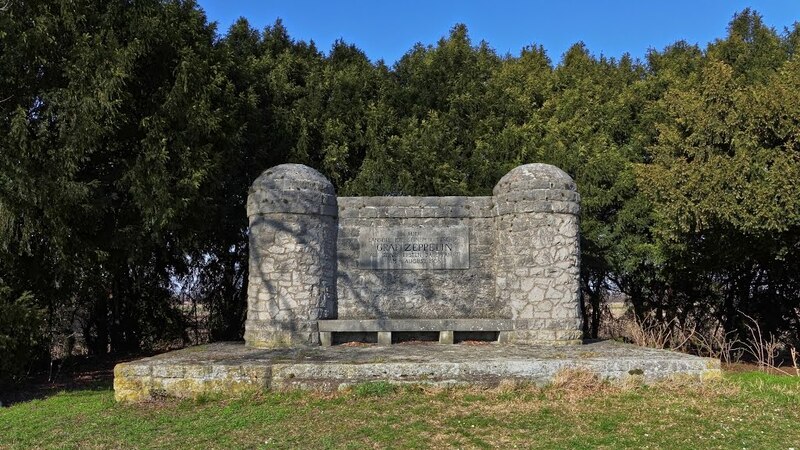 Today, there are three monuments to the LZ-4! 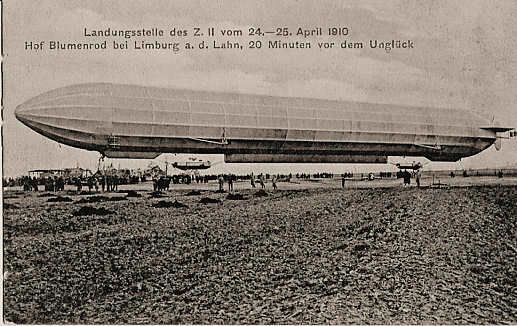 Two are at Kornsand where the LZ-4 landed on the Rhein, and one is at Echterdingen where the great airship was destroyed. 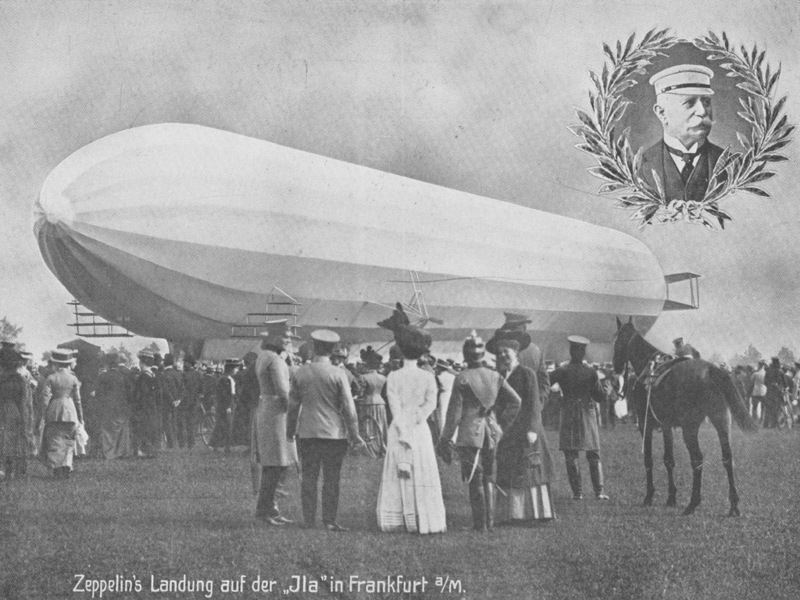 The inscription reads: "Here opposite [a/the Zeppelin] landed on the Rhein on [its] first long trip". The 2nd monument at Kornsand is dominating, yet obscure. 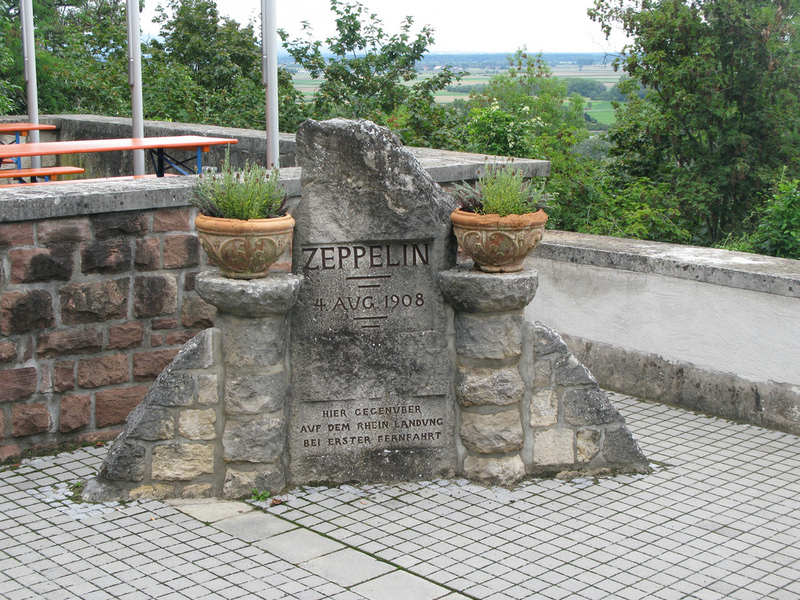 It is not a monument dedicated to the LZ-4, rather, it is dedicated to Graff Zeppelin. The imposing monument reads: "Here Graf Zeppelin landed with his airship on his first endurance flight on 4 August 1908". 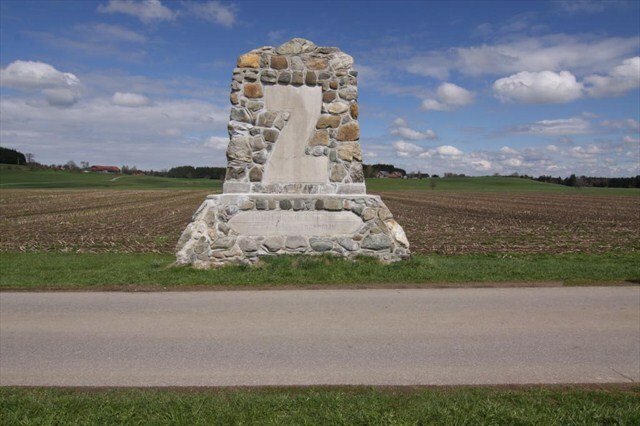 And finally, the 3rd monument to the LZ-4 is at Echterdingen where the LZ-4 met its fateful accident. The memorial was erected in 1908. The monument is decorated with bronze plaques, a portrait of Graf Zeppelin on the front and a rising eagle on the back. In addition to the portrait an inscription reads: "Here Count Zeppelin landed for on solid ground for the first time on the 5th of August 1908." The inscription under the portrait reads: "He struggled long and hard with the Spirit of the Air Successfully vanquished the grim opponent. From a sea of flames he rose up More magnificent than ever before. To the pride of Germans he soared up courageous; To him is set in stone (the name) Count Zeppelin!" (thanks to Alastair Reid for the translation). The back shows a rising eagle and the inscription: "As through the dark clouds of the Aar rises to the golden light, so by tribulation and need the hero struggles to victory." The LZ-5 has been honored with six monuments. In no particular order they are at: Erpel, Frankfurt, Köln (Cologne), Limburg, Weilburg, and Bad Homburg. On the 2nd of August, 1909, Count Zeppelin in the LZ-5 (Z-II) was attempting to fly to Cologne following a general track along the Rhine. Approaching Erpel, the ship was met with a strong storm. Though the zeppelin struggled against the winds, the residents of the local communities were delighted and many hundreds came out, sought high ground, and watched and admired the airship fight the winds. Eventually Zeppelin gave up, and turned the airship around and flew it to Frankfurt. 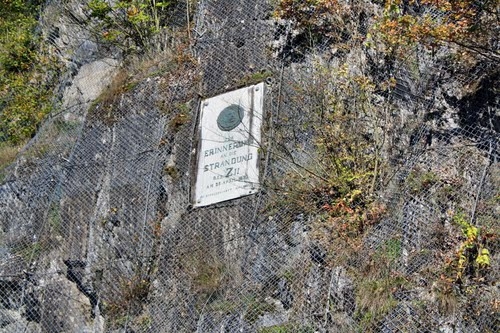 In 1914, a monument was erected on the cliffs of the Erpeler Ley, overlooking the Rhine. 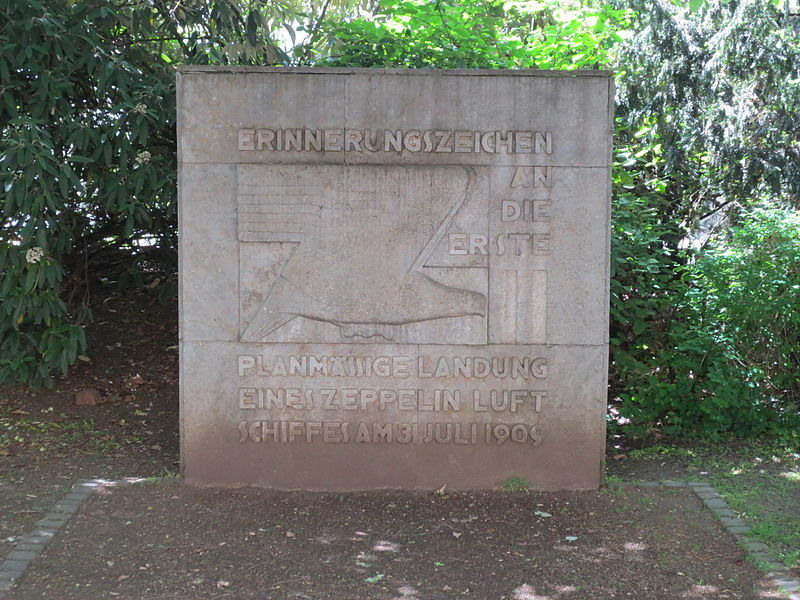 The inscription reads: "Memorial stone - First passage of a steerable airship above the river Rhine - Storm ride - By His Excellency Count Zeppelin with (the) ZII on 2nd of August 1909 - Dedicated by the Erpel community"
This is the LZ-5 (ZII) having landed at Flugplatz Rebstock (Frankfurt am Main) on 31 July, 1909. 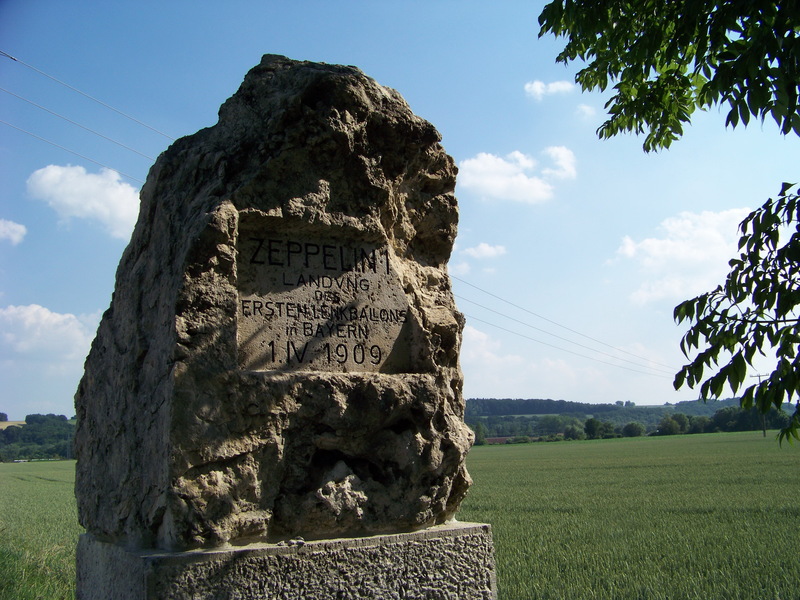 There is a monument commemorating the 1st landing at Frankfurt am Main of the airship LZ-5 (ZII) on 31 July 1909 as part of the airshow at Rebstock (German: Flugplatz Rebstock, or Frankfurt-Rebstock). The actual landing site is not far to the West of this marker). The Internationale Luftschiffahrt Austellung (International Airship Exposition) was held 10 July 1909 to 17 October 1909. 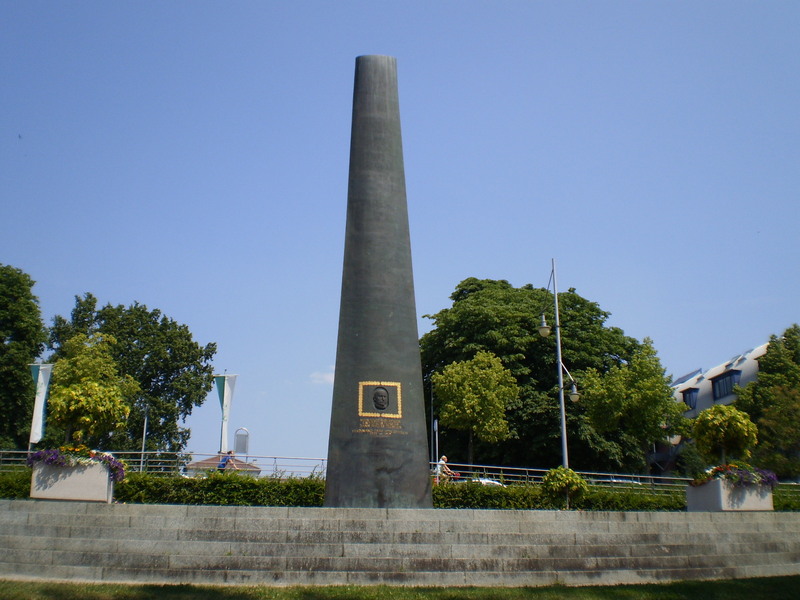 The inscription reads: "In remembrance of the first scheduled landing of the airship ZII on 31 July, 1909"
This monument commemorates the visit of Count Zeppelin to Cologne (Köln) on 5 August, 1909. The red dot in the upper-left in the photo above is the site of the great airstrip hangar at Bickendorf, the red line shows the route of Count Zeppelin, and the other red dot the home where he stayed. The parade ended at this house, where the Count spent the night. Today, the house is still marked to commemorate the great event. 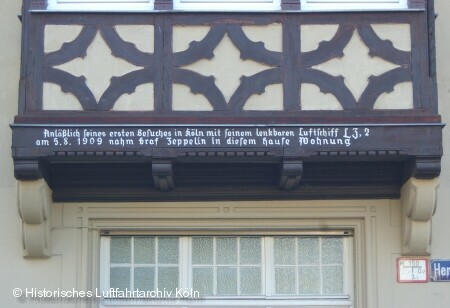 The inscription reads: "On the occasion of his first visit in Köln with his airship Z3, 2 am on 5 August,1909 Graff Zeppelin resided in this house." There are a couple of terrific webpages by Werner Müller (in German) about the LZ-5 visit to Köln in Aug 1909, and about the airfield at Bickendorf where the LZ-5 hangar was located at koelner-luftfahrt.de/grafzeppelin.htm and here koelner-luftfahrt.de/grafzeppelin.htm. Well done! Here the LZ-5 (Z-II) was ripped from its mooring by strong winds. (Paraphrased from http://www.weilburg-lahn.info/zeppelin/z2_10.htm.) 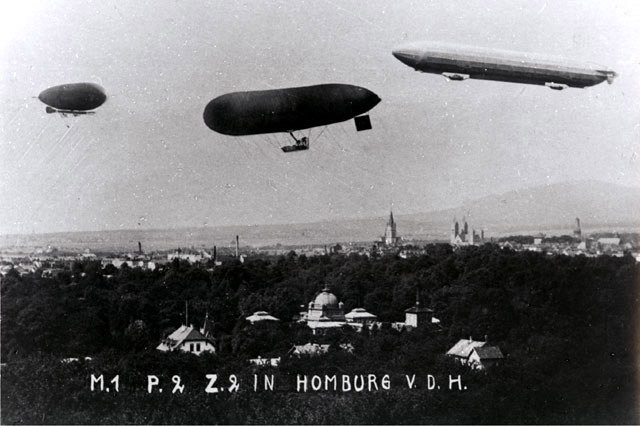 The airship Z-II had started on 24 April, 1910, in Bad Homburg to the return flight to Cologne. 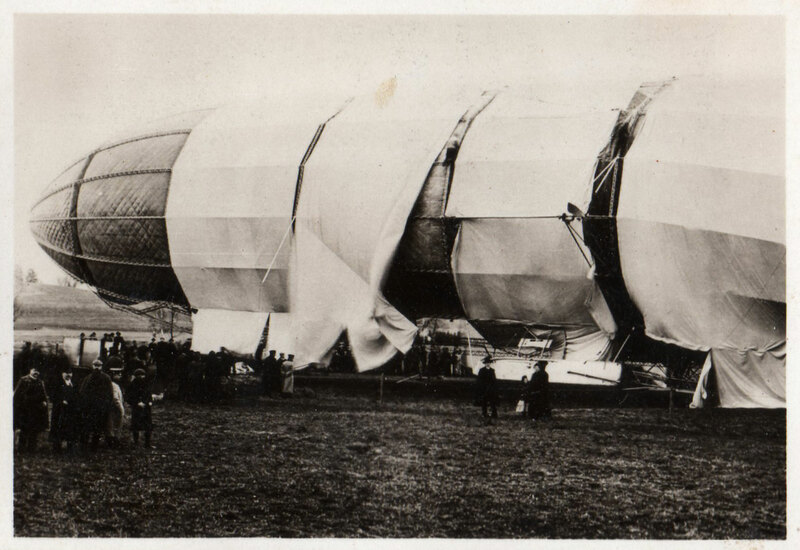 Due to bad weather conditions, the airship was brought down near Limburg, in an open field at Blumenrod farm. After the landing, the Z-II was tied to a large farm trailer. The next day, a gust of wind broke away the mooring and drove the airship, unguided to Weilburg. There it bounced against the rocky slopes of Webersberg and crashed. 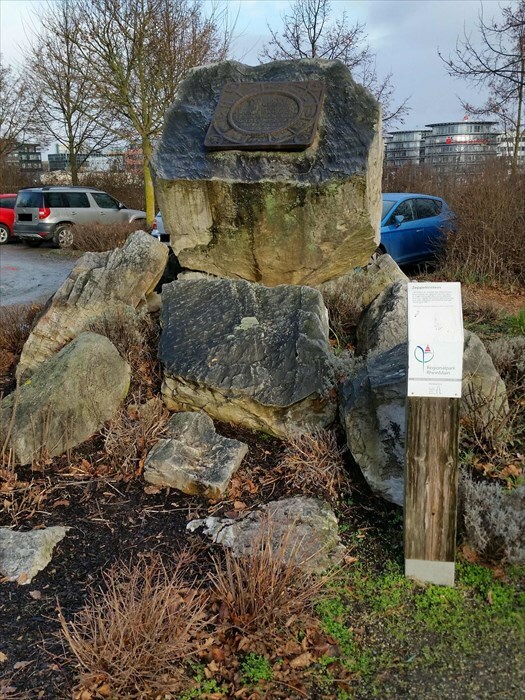 To commemorate the location of the forced landing of the airship Z II at Blumenrod, a rock was placed with a bronze plaque near the landing site. 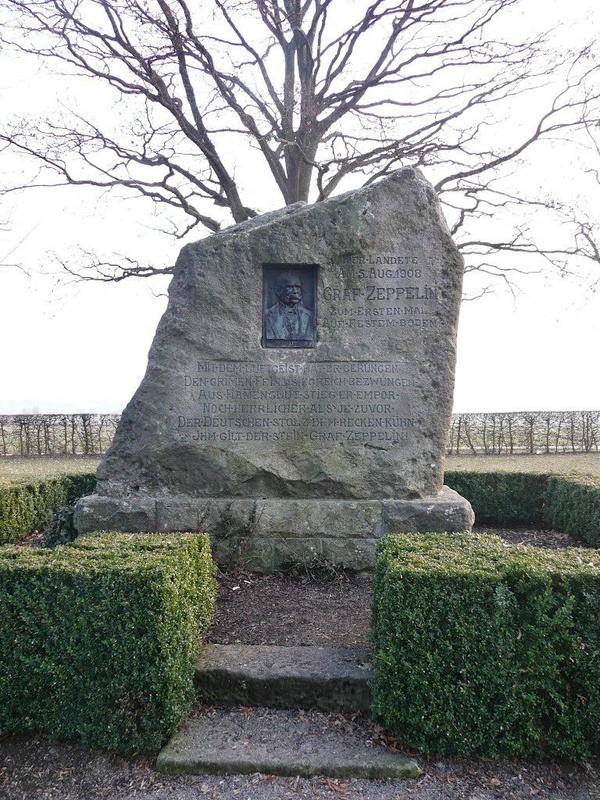 The memorial stone was unveiled on 24 April 1985 in the presence of the granddaughter of Count von Zeppelin, Isa von Brandstein-Zeppelin. 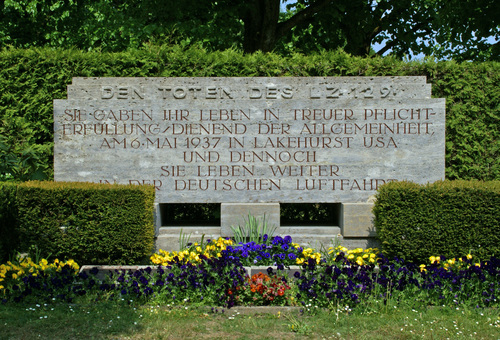 Plaque commemorating the crash of the LZ-5 (Z-II). Photo credit: Rudolf Müller who graciously provided the cordinates of the stone. IN MEMORY OF THE INTERMEDIATE LANGING OF THE AIRSHIP Z II on 24-25. APRIL 1910 . Here the LZ-5 (Z-II) was destroyed. Believe it or not, there is another marker here, commemorating the crash site of the LZ-5 (Z-II). The marker is located on the side of the train bed at (Lat Lon) 50.478826 008.267160 (best guess). Marker of the location of the wrecked LZ-5 (Z-II). Photo credit: Panoramio photo by Rainer Pesch. (I had to guess the exact location of the marker as it is not visible on the maps from overhead imagery). Here the LZ-5 (Z-II) was observed by Wilhelm II, Emperor of Germany in April 1910. Just one month before the LZ-5 (Z-II) was destroyed, the Emperor asked for all his military airships to be displayed for review. The three airships were the LZ-5 (Z-II) of Count Ferdinand von Zeppelin (far right in the photo), the small airship M-1 of Major Hans Groß (far left), and the Parseval "P-II" (PL3) (middle) of Major Prof. August von Parseval. Marker commemorating the simultaneous overflight of the Z-II, M-1, and P-II in April, 1910. Photo credit: Undetermined. That's all the monuments I've located for the LZ-5! Now, on to the many other monuments in Germany to the great Zeppelins! For that, I created a 2nd webpage since this page is already so long. Please visit the 2nd page at germany2.html.